Tenacious Toys has teamed up with NEMO to release a Five Points Festival 2018 exclusive colorway of TT’s store mascot, Danger! 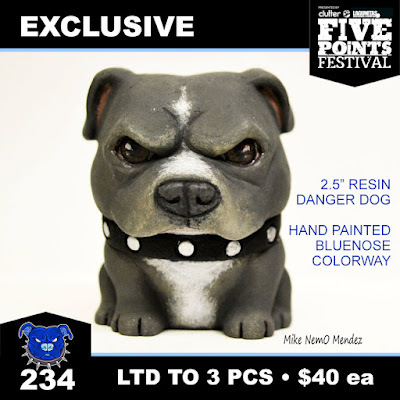 The Five Points Fest exclusive Bluenose Danger Dog stands 2” and is limited to just 3 pieces. Based on an illustration by Playful Gorilla, Danger was sculpted and painted by Mike “NEMO” Mendez. Collectors can purchase one this weekend at the Tenacious Toys FPF booth #234 for $40. Blanks will also be available for $20 each.